Many studies have focused on ways to help effectively detect mesothelioma early, allowing for more treatment options and an improved prognosis. In recent years, researchers have discovered various biomarkers that can help detect the presence of mesothelioma cells and enable doctors to diagnose the disease sooner. Researchers have also been further investigating gene mutations and fusions linked with mesothelioma that can help detect and better treat the disease. A study from 2016 has even shown that compounds in a patient’s breath can quite accurately detect the presence of malignant pleural mesothelioma. In December, the researchers behind the study released their results from an even wider study on breath analysis for mesothelioma, which validated their prior results. Studying a patient’s breath for markers of disease, including various types of cancer, has been an interesting area of research in more recent years. Analyzing a breath sample is non-invasive, extremely time efficient, and can provide a lot of information regarding a person’s health. Though there are many methods and types of equipment that can be used for such analysis, the researchers at Gent University in Belgium behind these studies relied on multicapillary column-ion mobility spectrometry (MCC/IMS). The MCC/IMS method has been noted as being able to conduct a full breath analysis in just about 10 minutes. On its own, ion mobility spectrometry is an analytical device that separates and identifies molecules in gas, and has been used for detecting many substances including drugs and explosives, as well as in the medical field with various diseases. The device is very sensitive, and can detect even the slightest trace of a substance. The MCC/IMS method works by detecting volatile organic compounds in the breath, which can infer someone’s health status. These compounds in the body are mostly blood-borne and act as biomarkers for specific diseases. Detecting certain volatile organic compounds has helped researchers detect various kinds of cancer, like mesothelioma, lung cancer and breast cancer, as well as other diseases. With this study, researchers found they were able to detect those with mesothelioma versus the healthy control group and former asbestos workers at an overall 87% accuracy rate. The high accuracy and sensitivity of the test suggested to the researchers that breath analysis through MCC/IMS could be an effective method to detect mesothelioma and act as a screening tool for those most at risk. The breath tests provided varied results among the groups, though many with very high accuracy. For instance, the researchers found an accuracy of 96% when differentiating former asbestos workers and those with a benign asbestos-related disease from those diagnosed with mesothelioma. This study served as a validation of their prior results, helping to further show that such tests could differentiate between patients with mesothelioma and those at a high risk of disease with great accuracy. 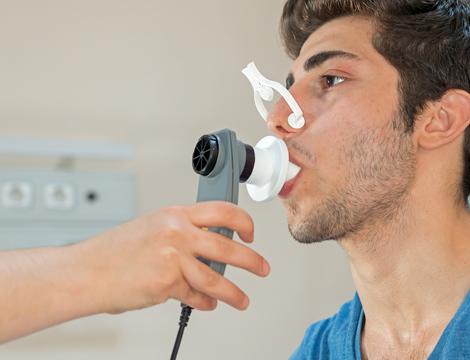 Based on their results, the researchers concluded that breath analysis could be used as a screening tool to help rule out mesothelioma or detect the disease sooner. Early detection like this could greatly increase patients’ treatment options and improve overall survival. Finding potential screening methods or improvements to diagnose mesothelioma at an earlier stage can mean a huge difference for many patients. Mesothelioma survival rates have improved very slightly over the years, but there is still a long way to go. Most patients still face a prognosis of just 1 year or maybe up to 21 months, partially because of the difficulties in detecting the disease. This study provides hope that researchers can continue to find ways to improve diagnosing mesothelioma. With more research, this breath test may be a viable option to utilize at a larger scale when examining patients with past asbestos exposure. With other methods for breath analysis, determining the sensitivity and accuracy of other similar tests in detecting mesothelioma may also be another aspect of future clinical trials. This area of study overall is bringing exciting discoveries in diagnosing many types of cancer and disease, and hopefully will continue to be an important aspect of research in this new year.